Is your garden all abuzz? With a little planning, you can create the perfect environment for our pollinating friends. Why attract pollinators? Your vegetable patch will be even more abundant, your ornamental plants will set more seeds for birds and many pollinators act as beneficial insects by eating pests. Attract these insects with a wide range of flowers for food and enjoy a long season of continuous bloom. Sometimes, pollinators are picky about what plants they enjoy. Many butterflies only have one or two host plants. For example, monarchs need milkweed, while swallowtails need parsley, dill or fennel. To attract adult pollinators, add perennials and annuals that are nectar magnets including butterfly bush, purple coneflower, verbena, salvia, lantana, Joe-Pye weed, and monarda. It’s very important to limit the use of pesticides so you don’t kill the insects you are trying to encourage. Beneficial insects need water, but their delicate bodies prefer a shallow pan of wet sand where they can get moisture, but not drown. A sprinkle of salt in the pan mimics minerals found in nature. Place it in a protected spot away from strong winds and watch for activity! Check out Winging It Day on Saturday, August 3 at The Growing Place in Aurora to learn more about creating pollinator-friendly gardens. The festival celebrating all things with wings returns with special guests from Midwest Groundcovers, Monarch Watch and S.O.A.R. – Save Our American Raptors. Enjoy a butterfly release. Children and adults will be able to create crafts focused on bugs, birds and butterflies, plus visit information stations throughout the day. Discover how to easily add attractive native plants to your garden beds to encourage beneficial insects and birds. Kids can make their own butterfly wings and join in the parade! Take a tour with Madame Monarch and salute the butterflies! We’ll release our captive butterflies at the end of the parade. 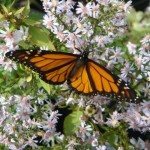 Find out what monarch butterflies need to thrive, how this signature species is doing and what you can do to help. Be amazed by the elegance and beauty of the raptors from SOAR. Learn how these sleek predators survive and thrive.